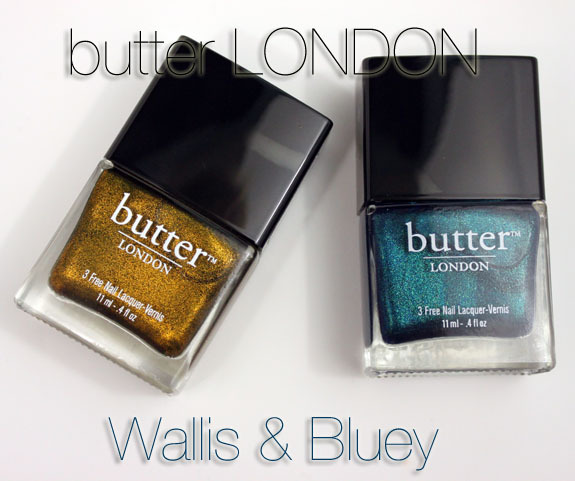 butter LONDON’s fall 2011 collection includes both Wallis & Bluey, two colors who nearly escaped my grasp! Wallis is an antique looking metallic olive green color with intense gold and green shimmer. INTENSE! This baby is so gold and so green and it positively glows. It’s stunning. The most stunning green I’ve seen in awhile in fact! 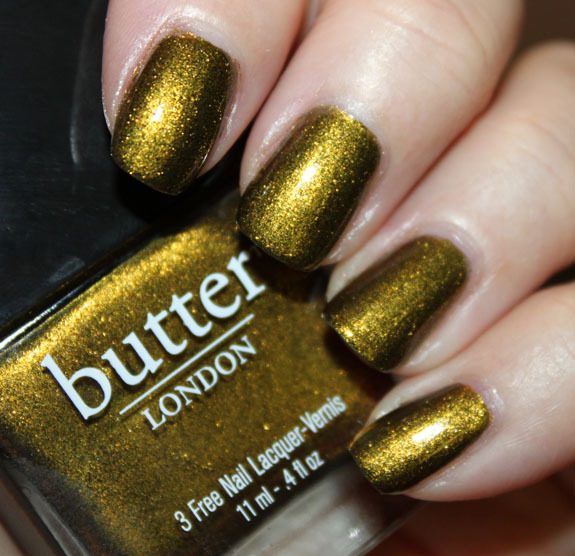 The formula was really good, it was smooth and creamy and covered completely in just two coats. Bluey is a medium deep metallic blue/green. What they call a “peacock” color. In the bottle you can pick up the green a little more than on the nail I think. On the nails it translates mostly to a metallic blue with blue shimmer and a little green. It’s a nice color, but I was honestly hoping for something deeper and more interesting. 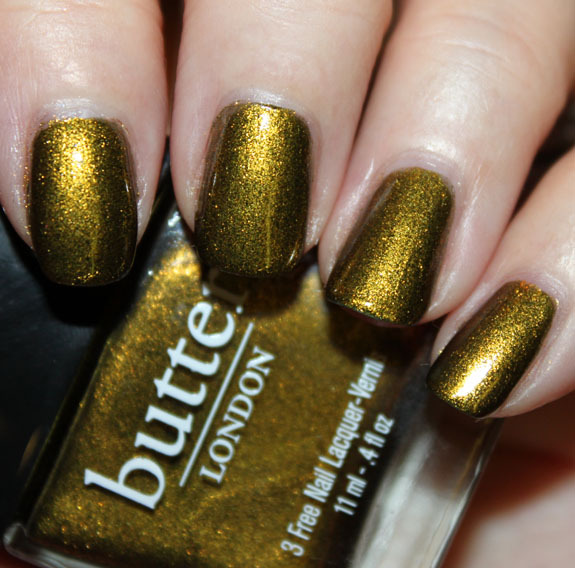 This is one where I love it in the bottle, but not as much on the nail. The formula was more sheer than Wallis for sure. I needed three coats to completely cover with this one. Did you pick up either of these colors? I’m so glad to see your swatches! I’d been debating both colors. Now I know I need Wallis, but I can skip on Bluey. Going to pick these up soon. I passed them by twice and now your swatches have created lemmings! I picked up Bluey during Ulta’s BOGO this past week. Disappointed to read your take but I am hoping I love it! Teals make my knees weak. Love Wallis! Looks great with your coloring! Wallis is a no-brainer… picked it up at Ulta on the BOGO deal. It was the last one they had… and I literally did an evil laugh as I snatched it up. I also got Lady Muck. Wallis is a stunner I will be wearing often this fall… So glad I didn’t get Bluey, I’m not big on 3 coaters. I love Wallis! It’s like a more olive version of MAC Immortal Gold. 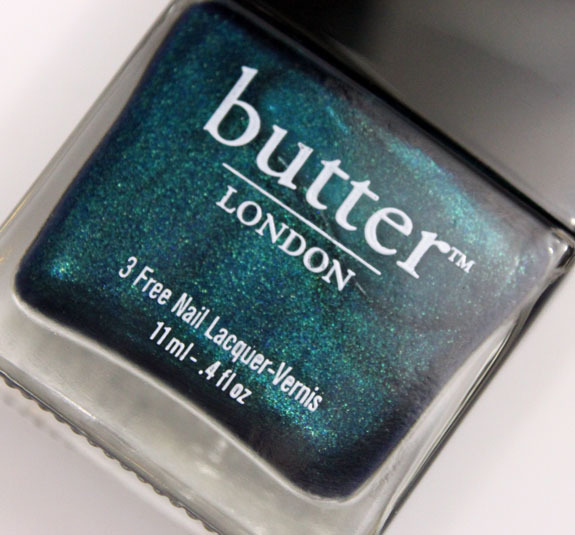 Gah, I wish I had woke up in time a few days ago when Ulta had Butter London polishes on sale for buy one get one free. Everything was sold out by the time I woke up! I really need Wallis. I bought these 2 a while ago…planning on putting Bluey on my toes tonight! Thanks for the fab swatches of these 2 beautiful colors! I got Victoriana and Bluey at the Ulta BOGO sale. Put Bluey on last night and LOVE it. I’ll be posting it to my blog tonight. I don’t mind 3 coats as long as I can do thin ones, and 3 thin coats were perfect on my nails. Both of these are gorgeous. 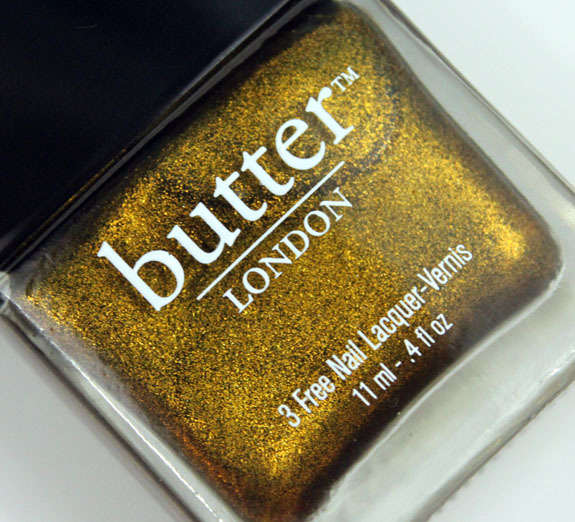 I’ve never tried any Butter London polishes, and these look like 2 great ones! 🙂 Thanks for swatching! Gah! I want these two so badly! Although, I must say Wallis is the stand-out from your swatches! I have Bluey but really wish I had picked up Wallis as well! 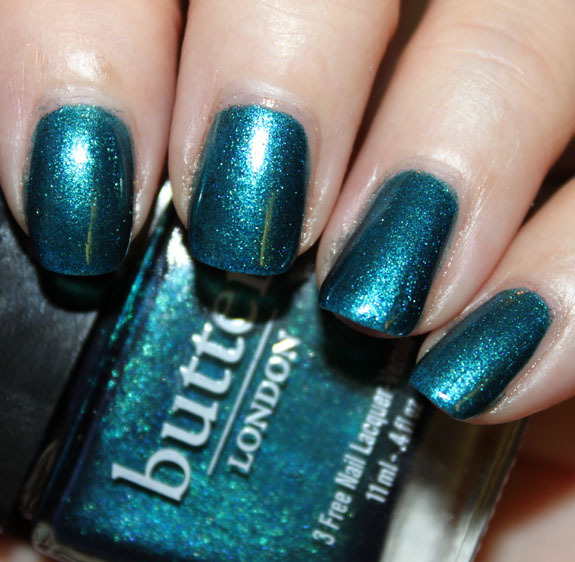 To me, Bluey is like a Fall version of Zoya Charla….I like it, but don’t really *love* it. they’ve an amazing sparkle, love them! Wallis is amazing, I never thought I’d go for a shade like that but WOW! I got Wallis,Diamond Geezer,Henley Regatta & Rosie Lee. I’m impressed with how long they wear. I love Wallis! Haven’t gotten a chance to get it yet but hopefully I’ll come across it somewhere. Such an interesting color! I actually grabbed up both of these and was wearing Bluey earlier this week. My friend mentioned several times how much she liked it, although we agreed it wasn’t exactly ‘blue’ but more teal. Now I’m thinking peacock is a better description. Anyway, I’m babbling, just found it funny that we picked up the same 2 colors, love them! too funny! I got both of these when ulta have their sale in stores (i really wished i would have know that they wouldn’t have limited me to just two!!!) I just put wallis on a few minutes ago and i love it! I have yet to put on bluey but it def looks like charla’s kissing cousin. wow wow wallis! i love two-coaters, and this one is a real beauty! as for bluey… looks almost like a franken i just made. so glad you were able to pick up wallis; i hope i’ll be just as lucky during my next trip to ulta. Joyce´s last post…notd: wet n wild – rustic. with stamp! Hrm. I’ve passed on Wallis a couple of times, now I’m rethinking that. I’ve only got a few Butters – Lady Muck is really nice, Victoriana is a STAR, but No More Waity, Katie is … man is it a dog. Worst formula ever. Went on streaky and chunky and gritty and just urgh, so I’ve been gunshy of ordering more. I really adore the look of Bluey (it’s like Nubar Earth, just a bit more…uhh, bluey) but I’ve got SO many teal/turquoise polishes, and I’m not a fan of so-sheer-it-needs-three-coats. Walis has been on my wishlist for awhile. She is stunnin! So glad u swatched it. I always value your opinion. I bought Wallis during the beauty steal. It is next in line to be used! How close is Wallis to Orly’s Not Rocket Science? It looks a little close. Bluey is so pretty, but I’m trying to think if it’s more peacock than Zoya’s Charla. Awesome! Nothing at all like CG’s Zombie Zest. It’s waiting for me for when I go home in two weeks…along with *cough* about 50 bottles of polish I ordered. Nothing like presents for when I get back! Still would love to see a comparison of Wallis vs ZZ and/or Spa Ritual’s Optical Illusion. Like many others I picked up Wallis during Ulta’s BOGO sale. It’s gorgeous and it was the one I knew I had to get. I also picked up Bluey. Got both o’ those! Zoya Charla is a bit lighter, and the color is more variegated — it’s got flashes of aquas and blues and golden shades. And It’s Not Rocket Science is more sheer-foily and less dense looking, in a darker base, and is substantially more green than Wallis. Both are shades that, if my bottles broke tomorrow? I would *immediately* go buy new ones. Um. That was meant to be a reply to ManicuredSlayer. Not sure what happened. Too little coffee, fingers malfunctioning. So I just read the latest edition of Health magazine and they advertise Wallis in one of their spreads. Only in the magazine it looks like a true green. I’m curious to swatch this myself to see how much it really changes under different lighting. I like Wallis but Bluey I can skip. Glad to see these. Hi, great colours these but just a question. You can see in the photo of Bluey a light streak in yellow on the right of each nail. Is this just the camera/flash or do you actually see this in person with normal light? Thanks. That’s from the lighting, there isn’t any yellow streaks in it. Just blue & green. Wow, I LOVE Wallis! I have an army of green polishes, but nothing like this one. Didn’t think I would like that kind of color, but I actually really like Wallis!